Irrevocable may not mean what you think it means when it comes to trust planning. Thanks to a process known as “trust decanting,” a trustee can change irrevocable trust terms. 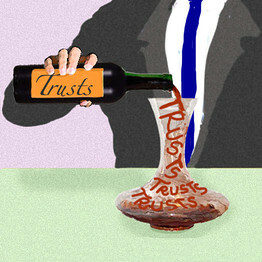 The decanting process occurs by figuratively pouring the trust assets from an old trust to a new trust agreement. Just as one decants wine by pouring from an old bottle to a new one, a trustee can move trust assets to a new, more favorable trust. Nevada, along with 20 other states, has very favorable decanting laws in place. There are limits as to what can be accomplished with decanting. Trustees cannot alter a beneficiary’s already-vested interests in a trust. However, a trustee can push back the age at which the beneficiary receives a payout. Importantly, the trustee can change the governing law of the trust by moving the situs of the trust. Nevada is the premier domestic self-settled spendthrift trust state so many trustees look to move their assets to Nevada. In addition, if there is no successor trustee named, decanting can make it possible to name a proper successor trustee. Nevada law is very favorable because there is no statutory requirement to notify beneficiaries of the decanting. The trustee does not need to provide beneficiaries copies of the existing or new trust documents. These privacy protections greatly favor the use of Nevada trust laws. The trustee has discretion to seek court approval for the decanting process but is not required to do so. In reality, the vast majority of trustees seek beneficiary approval before starting the procedure to decant the trust assets. There are uncertain implications for gift, income, and generation-skipping transfers taxes. The Internal Revenue Service has not issued guidelines related to the federal tax issues presented by decanting. However, the IRS has solicited comments for several years now and guidance should be forthcoming. Even without federal income tax guidance, there are state income tax savings to be achieved by moving trust assets to a state like Nevada without income tax. In terms of domestic jurisdictions, we have used Nevada over the years more than any other state. We like it for the protective legislation is has on the books, the quality of trustees available, its proactive attitude and approach toward domestic asset protection law, and how it seems to strive to make what it has even all the better. Nevada continues to surpass other states in regard to its asset protection trusts and the protections available to debtors. Our office can help you protect assets from creditors and assure your wealth preservation.